Hobbies? Playing piano, studying foreign languages and outdoor activities like running, biking and Hiking on big mountains, especially if it is with other friends. What's your favorite class? If I were to pick one, I would say Dr. Snyder’s Recent Philosophy class. It was a fantastic class. I had the opportunity to have oral presentations which allowed me to practice public speaking, and put in tangible words to other, difficult concepts. This class really gave me a much clearer understanding of Philosophy as a whole. It would also be fair of me to note Dr. Cuddeback, Dr. Flippen, and Prof. Wunsch for the love of the pursuit of wisdom that they have sown in me. Do you play any sports? My favorite sports are soccer and swimming, although i like soccer the most by far. I am participating in the intramural soccer this semester. What is your favorite thing about Christendom? My favorite thing about Christendom is that it is an institution that cares about the formation of the whole human person: body and soul. Why did you choose Christendom? After I finished High School in Colombia, I came to the United States with what at that time was an unthinkable dream: going to College in this country. But I did not know about Christendom. 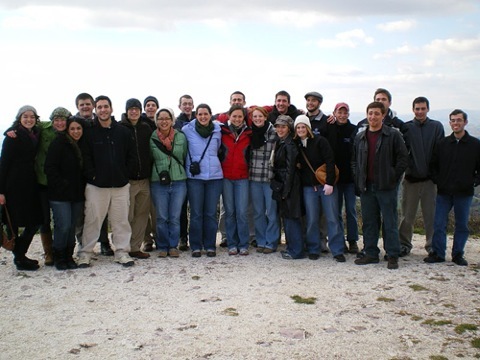 While I was working and learning English in Alexandria, VA, I became good friends with some Christendom grads, and I always admired them for their great spiritual and intellectual formation. This was a clear sign that God was calling me to Christendom. After four years here and being away from home, there are no regrets of my decision, and I can say that in Christendom I have found another home. What do you plan to do after graduation? For my short term plans, I am going to stay in the United States in the D.C. area and plan on being a linguist for the US federal government... my long time plans are still in God’s hands. 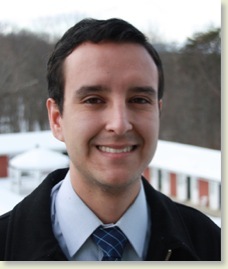 Friday nights at Christendom have a new best friend: the College's Registrar, Walter Janaro. 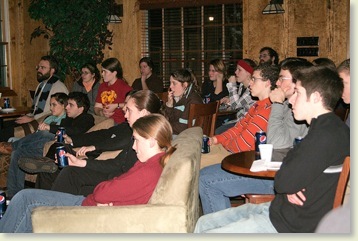 His movie nights continue to bring students into St. Kilian's Café for a great time. This films shown are always high-quality in content and the presentation is great. Utilizing the café's great sound system and projecting the video onto a large screen really creates a mini-theater experience. 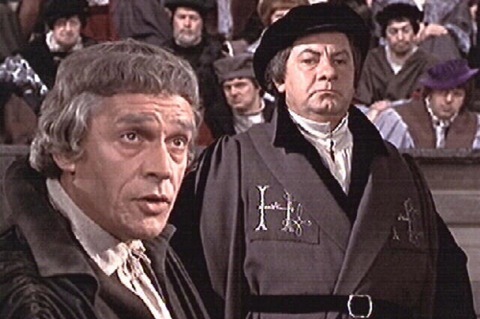 This week students enjoyed A Man for All Seasons, which tells the story of St. Thomas More, who stood up to King Henry VIII when the King rejected the Roman Catholic Church to obtain a divorce and remarriage. A Man for All Seasons won six Oscars: Best Actor, Best Cinematography, Best Costume Design, Best Director, Best Picture, Best Writing. Saturday night a cacophony of colors whirled around the dance floor in St. Lawrence Commons as students celebrated one last time before Lent began. 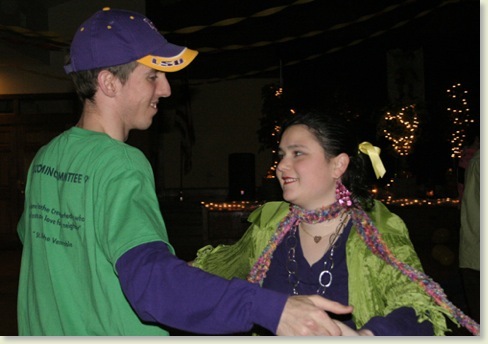 The event was the Mardi Gras dance, which was celebrated with a “topsy turvy” theme. Students were encouraged to dress in obnoxious, backward clothing, which several students enjoyed quite a bit. 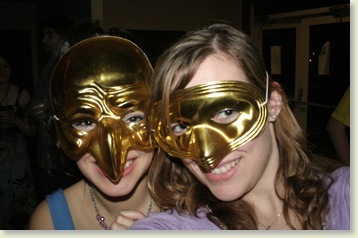 There were also masks on all the tables on the edge of the dance floor, as well as Mardi Gras beads for those particularly excited about the occasion. 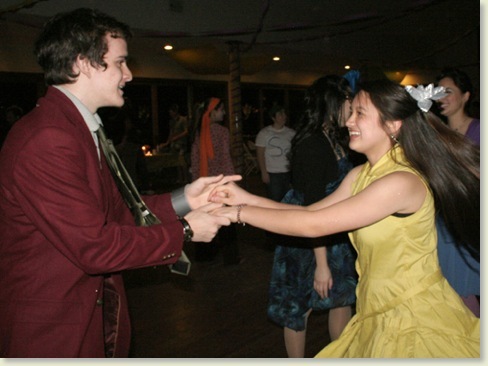 Students were really happy to have one last dance before Lent, and are in awe that they have to wait till Spring Formal (April 24th) to enjoy the fun of Christendom dances again. “It's so much fun to dress up like this! We won't get to for a while because of Lent!” Sophomore Grace Bellow said. 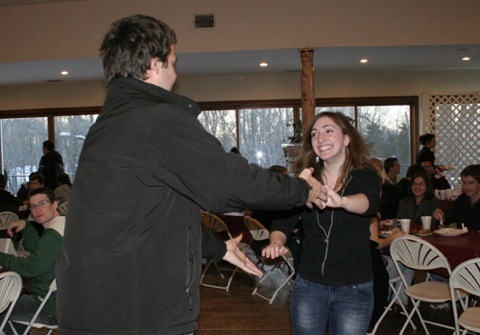 Freshman Thomas Ferrara sways across the dance floor with Sophomore Angela Swaggler. Sophomore David Frank swings with Freshman Sara Federico. 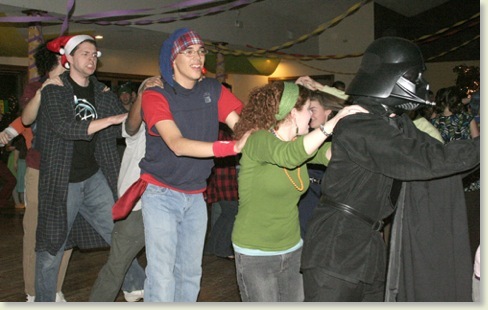 Even Darth Vader joined in the fun. On Sunday, St. Lawrence Commons was adorned in pink, red and white. 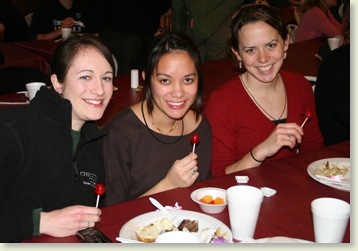 Love was in the air and romantic music added to the ambiance as students gathered for the St. Valentine’s Day Dinner. After a delicious dinner prepared by the kitchen and food service staff, students enjoyed a lovely dessert assortment of cookies, candy and cupcakes. Following which, the romantic comedy “Kate and Leopold” was shown. 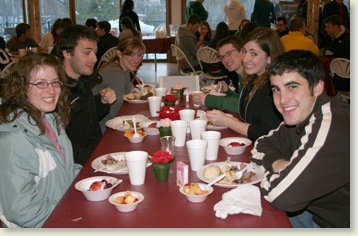 All the common tables had been arranged in the shape of a heart, and at the center, select students were paired at random as "Christendom College's Top Valentines." Couples included Freshman Anthony Readings and Sophomore Liz Sartor, Freshman Tim Beer and Senior Jeanie Goeckner, and Junior Tim Ginski and Senior Bonnie Wunderlich. Event coordinators Ryan Doughty, Troy Spring, and Eve Owen expressed their excitement in sharing their love of St. Valentine’s Day with the Christendom Community. 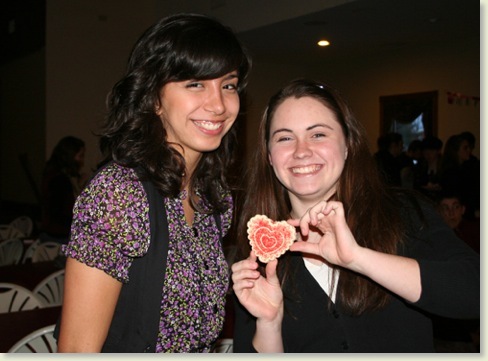 Freshmen Ana Sofia Artega and Eileen Dziak show off one of the tasty cookies. Top Valentines Tim and Bonnie got up and danced to song. Students traveled to Front Royal for the first of two Junior Visit Days on Monday. 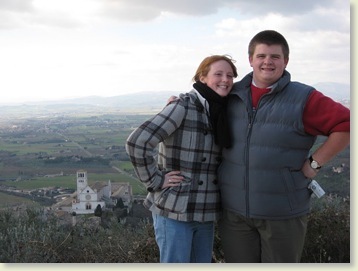 Students were able to sit in on classes, tour the campus, meet faculty and staff, view a slide show of Junior Semester in Rome, check out our residence halls and much more. The next one is being held on April 12. You can register for it here. Conroy traveled alone to Calcutta to work with Mother Teresa and the Missionaries of Charity at the age of 21 in 1986 and later in 1991. 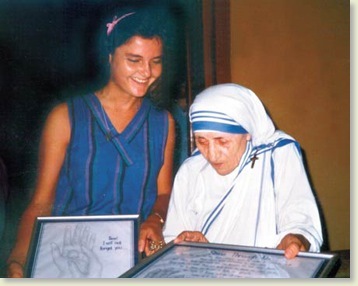 She and Mother Teresa kept in touch until Mother Teresa's death in 1997. Author of the best-seller, Mother Teresa's Lessons of Love and Secrets of Sanctity, Conroy recounted what she had learned from Mother Teresa through her experiences in Calcutta at the orphanage and the home for the dying. One of the powerful lessons that Conroy learned was “one, one, one.” Mother Teresa showed her that it all began with one person at a time. “Put all your love, attention, care, respect, and reverence into one human being at a time. Mother Teresa said, 'If I hadn't picked up that person off the streets of Calcutta, I wouldn't have picked up the 42,000 others.' Never think it's too small,” Conroy said. 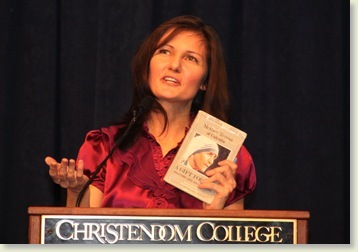 Read more about this talk here or download it at Christendom on iTunes U. 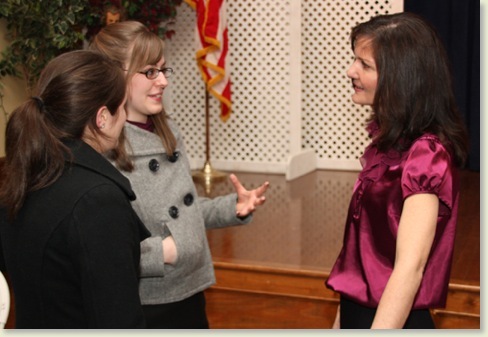 Seniors Maureen Dalley and Lauren Merz discuss Conroy's inspiring story further following the talk. Greetings from the Eternal City! I had to pinch myself as our plane finally landed in Italy, I could see my classmates felt just as excited. After all our planning and preparation, we were finally beginning our semester in Rome. No matter how many people we had talked to, no matter how much research we had done, nothing prepared us for the awe we felt as we first stepped on Italian soil. Our Rome Directors, Tomas and Caroline Fuerte, gave us a warm welcome and swept us off to our first Mass in St. Peters and a delicious pizza dinner served in true Italian style. Despite the good food however, most of the Christendom female students were more interested in the Fuerte’s baby, the cutest member of our large supper party. The male students of course were merely content with the food. 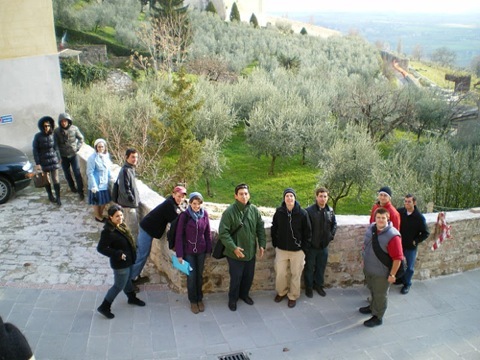 Just as we had recovered from our plane flights, the students of Christendom packed again and took a bus for a week long retreat which was divided between Assisi and Siena. Throughout this retreat, Mr. Fuerte reminded us of the fact that we were pilgrims in Italy, not merely tourist, we were walking on the ground of saints, a feat we should all strive to follow. Although our days in Assisi and Siena were busy with lectures and tours, we still had time to explore and sight see on our own. 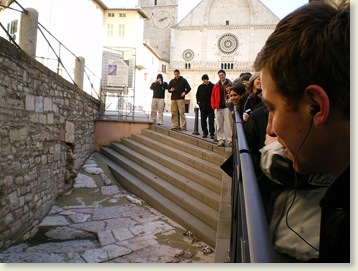 Our retreat chaplain, Father Dennis Himes, celebrated Mass for us every day, once even in the tomb of Saint Francis. Many of us elected to take the optional tour to the hermitage of Saint Francis during our stay as well. Although the walk was long, we all agreed it was worth it. A little humor was added to our pilgrimage when David Klosterman and Rocco Levitas decided to run ahead and scare their classmates by unexpectedly breaking out of the wood with wild war whoops. Although we were surprised, our initial shock changed to laughter when David slipped and fell, which totally ruined their brilliant plan. 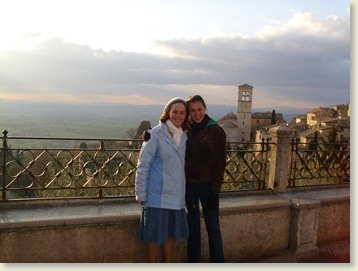 After three eventful days in Assisi, we finished the remainder of our retreat in Siena, the city of the great Doctor of the Church, St. Catherine. Mr. Fuerte showed us not only the church that housed the crucifix that gave Catherine the stigmata, but we were able to see Saint Catherine’s head as well. We also found the historical sites and churches of Siena so jammed with historical details that our heads and eyes boggled. We left Siena under a blanket of snow, a rare event apparently, and though we had enjoyed every minute of our retreat, we were ready to return to the Eternal City. We are now fully ready for our semester, thanks to the Fuerte’s talks and tours, Father Himes’ spiritual direction, important facts on Italian culture from a special lecturer Mary Nolan, and of course our dependable Residence Assistant, Beth Doherty. Arrivederci to Assisi and Siena, Rome here we come! On tour with Mr. Fuerte. 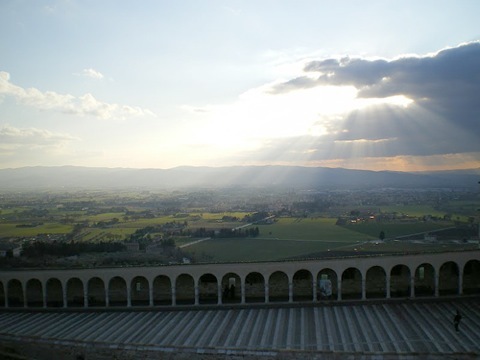 Rome Report Photographer John Kilackey snapped this breath-taking shot in Assisi. 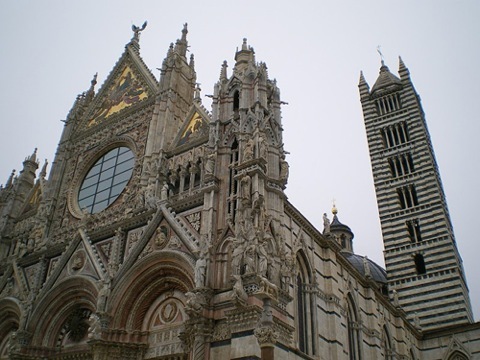 The historical and aesthetically rich Duomo of Siena. 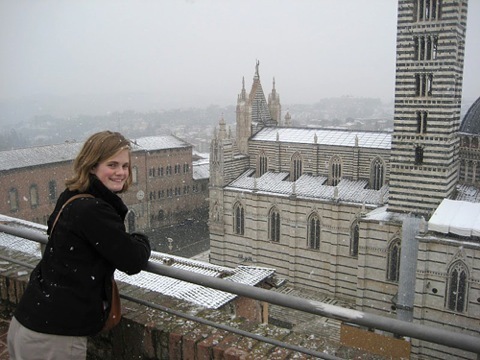 Elise Anderson enjoys snowy Siena. Spring 2010 Junior Semester in Rome. Monday, Wednesdays and Friday afternoon, students filter into classroom four in the basement of St. Lawrence Commons, for Fr. 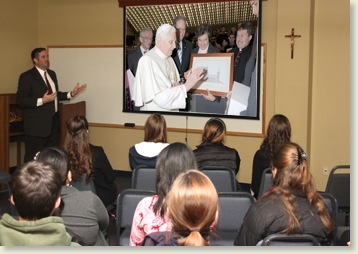 William’s enlightening Vatican II class. The class, which contains about 30 people has been in existence for a while, though this is Fr. William’s second year teaching it. 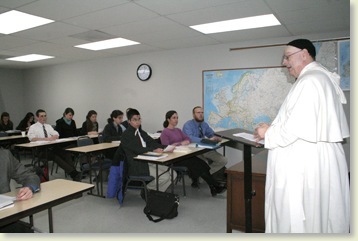 There is a lot of interest in the class and the students, as Fr. William affirmed, ask good questions and pick excellent paper topics. One of the reasons the class is so great is because so many people are so uninformed of what the council actually said. 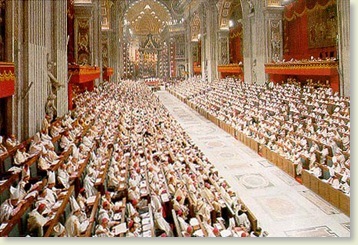 “There have been those people who have been told by their elders and others that the Second Vatican Council was the greatest thing that ever happened in the history of the church on the one end of the spectrum, and on the other end of the spectrum there’s an attitude that says ‘this is a Council about nothing that changed everything.’ And so people will come to their own evaluation of what they think of the council, but the course hopefully will give them some material to decide for themselves,” he says. The class goes over the Councils and Synods in the history of the Church, and then moves onto the Council of Trent, which Vatican II footnotes a lot. They then move onto Vatican I, to understand what’s happening in the nineteenth century. Then they continue on into looking at the documents of the nineteenth century and finally look at the documents of Vatican II. Essentially, Fr. 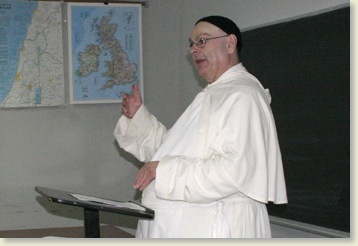 William’s Vatican II class is just one more reason to consider coming to Christendom. We are in our last week of the basketball season here in Front Royal, VA. This past Friday night the men’s and women’s basketball teams played in the Shenandoah Chesapeake Conference Tournament at Patrick Henry College. The Conference which was started a few years ago by former athletic director Tom Vander Woude as well as the athletic directors of Patrick Henry, Washington Bible and then Roanoke Bible College now Mid-Atlantic Christian University. The goal was to offer an end of the season tournament for these teams. 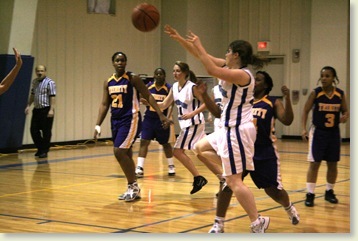 The women played Patrick Henry in the first game, whom they had beaten 2 times before during the course of the season. The Lady Crusaders played their “now assumed” tough defense and rebounded very well despite their relatively short team. 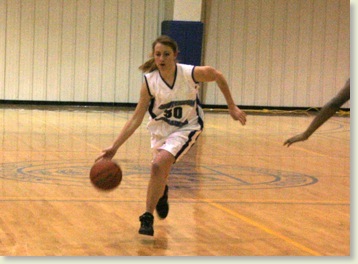 The game was back and forth between the two teams with Christendom leading by about 4 points for most of the game. Patrick Henry fueled a comeback late in the game which was capped by a controversial 3 point call which looked to be only a 2 pointer but which ended up sending the game into overtime. Throughout the game the Lady Crusaders got open shots and crashed the offensive boards, but nothing was falling for the Lady Crusaders tonight. The scoring was balanced between Meghan Kavanagh, Emily Baldwin, and Bridget Massur, but in the end the Sentinels of Patrick Henry pulled out a 4 point victory in overtime. The women finish their season this week with their last home game tonight at 6pm vs Gallaudet University and at Franciscan University of Steubenville this Saturday at 6pm. The men’s game proved to be as exciting! Having already played 3 times in the regular season and losing twice for the first time in the history of the two teams the Crusaders were ready to equal the score. The team started off hot with a suffocating defense that limited the Patrick Henry sentinels on the offensive end. Patrick Henry clawed back into the game and took the lead just before halftime. 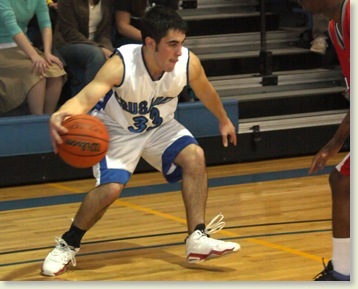 The Crusaders who did not shoot the ball well in the first half were led by Tim McPhee’s 11 points. The 2nd half saw the Sentinels race out to an early lead and build on it, big men Brian Fox and Sam McMahon got in foul trouble and with no outside shots falling the game looked headed for another loss for the Crusaders. But the men would fight back, down 16 points with about 5 minutes to go the Crusaders went on to outscore the sentinels 14-0 in the next 4 minutes of play cutting the margin to just a 2 point game with just over one minute to play. The comeback was fueled by an exciting pressing defense led by Tim Beer, David Townsend, and Mark Hepler. The Sentinels would score on their last 2 possessions . The Crusaders got the ball with about 8 seconds to go down 3 and a missed 3 point attempt by TJ Nacey rattled out the ball bounced to Mark Hepler who was in the right spot at the right time and put the layup in as time expired……AND HE WAS FOULED! So with the clock reading 0:00, freshman Mark Hepler stepped to the free-throw line with the Crusaders down by one. 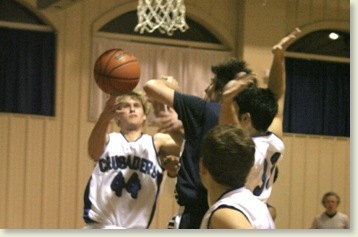 Unfortunately he barely missed the free-throw and the Crusaders came up one point shy. The Crusaders play their last home game of the season tonight at 8pm vs Gallaudet University and will finish at Franciscan University of Steubenville on Saturday at 8pm. The intramural dodgeball tournament also just finished up, see the intramural blog for pictures and updates from the tournament. Q. Can you tell me a little more about your Equestrian Program? A. This was the first year that our students have been able to take part in this wonderful equestrian program, and from everything that I have heard from the participants, it has been a great experience. This is designed for the student who just wants to ride on an occasional basis. Group Rides are scheduled two (2) times per month (6 per semester). The first several sessions focus on the formation or enhancement of riding skills. Later sessions are trail rides or organized riding activities in an arena. This is for the student who would like to work on riding skills, but only has a limited amount of time. Group sessions are scheduled weekly (12 per semester) and are under the direction of a certified instructor. 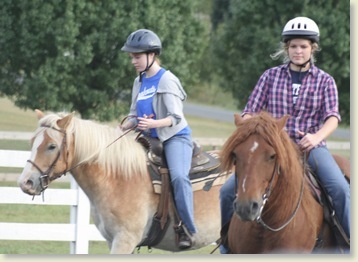 Students will see steady progress in their riding skills and will learn about basic horse care. This is for the student who wants to accelerate the pace of improvement in his or her riding skills. Group Sessions will be smaller and there is more individualized training by a certified instructor. Sessions occur nominally twice a week (any combination of week days or weekend days (24 per semester)). As much as possible, sessions will be tailored to the skill of the individual rider. 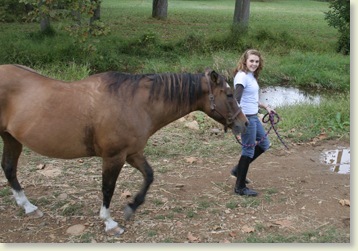 Here is the link on our website about the equestrian program. And here is a link to a story that our local Catholic newspaper did on the program last semester.